Along With Humans, Who Else Is In The 7 Billion Club? : The Two-Way There are now 7 billion people, according to the U.N.'s population division. That prompts a question: Who else is in the 7 Billion Club? To learn which other animals had reached that plateau, we asked wildlife experts — who said it's a tough call. But then the experts gave us some best guesses. And the consensus was that humans are the largest animals on the planet to have a population numbering at least 7 billion — but they're certainly not the only ones to reach that mark. More on that in a minute — but first, let's start with the basic premise. It's very difficult to say with certainty, "Right now, there are 7 billion humans living on Earth." Because, as our colleague Adam Cole explained in his video and audio report, for every new drop in the bucket, there's always a drop or two leaking out of it. In fact, the U.N.'s choice of Oct. 31 as The Day We Hit 7 Billion comes with some caveats — as Mark reported, the margin of error on the estimate totaled around 56 million. And the date announced by the U.N. doesn't match up with what the U.S. Census Bureau predicts. On its own version of a World Population tracker, the U.S. agency estimates that humans won't hit the 7 billion mark until March 2012. So, there's some unavoidable uncertainty here — questions of scale and logistics make it impossible to count 7 billion people who are all alive at the same instant. And if you can't count humans, then how could you expect to count rodents or birds? The most challenging of all may be the fish. Because if a fish holds still long enough for you to count it, that might be because it has just died — and can no longer be counted. You see where this is going. So, the experts do what they do better than anyone: They estimate — and they calculate biomass. For those of you who are rusty on your ecology, biomass is determined by multiplying an estimated population by its members' average weight. So, for humans, our experts settled on approximately 350 million tons — or 7 billion x 50 kg (110 pounds). And if that number seems lighter than you'd think, consider that the estimate must take children's lighter weights into account. Among land-based vertebrates, humanity's closest rivals in terms of sheer numbers are probably the brown rat (which, everyone agrees, outnumber us — but no one seems eager to count) and the domestic chicken (which numbered 18.6 billion in 2009, according to the Food and Agriculture Organization). "No other large mammal comes close to us in terms of numbers. According to the FAO, there are around 1.4 billion cattle in the world and about 1.1 billion sheep (in 2009). The total cattle biomass would be greater than ours (more than 500 million tons), but sheep biomass would be considerably less (below 100 million tons)." Loh was kind enough to provide data for a chart. While it doesn't pretend to be an exhaustive survey of species with large populations, it does give a sense of the range of life on Earth — and how different populations compare to one another. Among all animals, ants outweigh us in biomass — putting billions and billions of tons up against humans' fewer than 500 million. And while they're both tiny and lacking a backbone, krill are the champs among animals worldwide, in terms of numbers, with a population estimated at 500 trillion. We asked researchers at the World Wildlife Fund in Washington, D.C., for their opinion — and for details about animals with large populations. The WWF scientists said that among birds, the most populous species is believed to be the red-billed Quelea; among fish, the Peruvian Anchoveta gets at least one expert's vote. "Elephants don't come close to us: There are about half a million of them, so they would weigh in at a couple of million tons" of biomass, Loh says. So, we've got the elephants beat. But lest we humans start getting full of ourselves for numbering 7 billion, one WWF expert reminds us, "The passenger pigeon used to number an estimated 3-5 billion, and look what happened ... that should send us all a warning!" And to be sure we got the point, another added, "Of course, within each human there are animals. So, our own parasites must outnumber us." 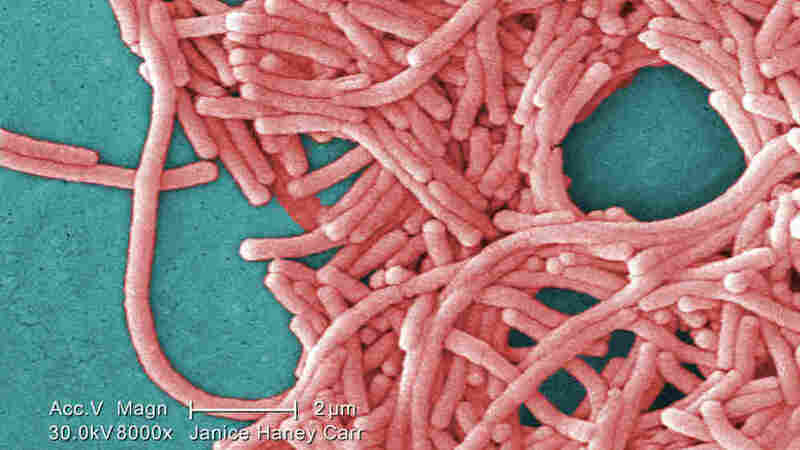 Oh, The Bacteria: A colorized electron micrograph image from the Centers for Disease Control and Prevention shows a large grouping of Gram-negative Legionella pneumophila bacteria. There are quadrillions of bacteria in the world, far surpassing humanity's 7 billion.